TO RUN ON YOUR DAIRY SLURRY. You choose to invest as you have the resources and it suits your farm. You’ll benefit from a choice of funding routes, and from Government Funded schemes such as Feed in Tariff (FIT) and Renewable Heat Incentives (RHI) as well as reduced or even FREE heat and electricity. The returns you can expect to receive from your Biogas plant pay off because the cost of our specialist system designed for diary farms is less than competing systems. You’ll also produce green energy non stop and not be at risk to every increasing energy costs. 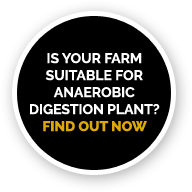 The Anaerobic Digestion (AD) plants from our partners, Biolectric, are designed specifically for diary farms and runs only on slurry, so there’s no need for any other additional crops. The reduction of your CO2 footprint, reduction of CH4 in the atmosphere that the addition of a Biogas AD plant will create you will find the plant can be a useful credential to your own farm and your supply chain may approve of your use of green energy. Your Biolectric plant could generate FREE heat and electric. You’ll receive a fixed price per kWh for green energy you produce therefore allowing you to become independent for your energy supplies, and no longer tied to utility providers. We’ve calculated that using your dairy slurry, the addition of a Biogas AD plant, can increase your milk value by up to 5p per litre for the next 20 years. Using the slurry already available on your farm, there’s no additional noise or odours from the supply of additional crops, surplus or waste. The resulting slurry quality is greatly improved, produced locally, with no hidden transportation costs or emissions, is renewable and available for free. Your Biolectric AD Biogas plant can add a secondary income through additional heat processes. Build, install and commissioning is relatively simple and speedy. We can have a Biolectric AD Biogas System up and running in as little as 2 weeks! What do you need? 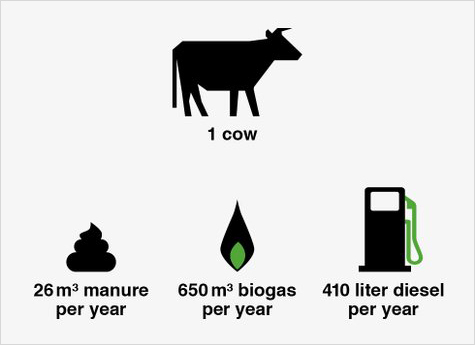 At least 1500m3 liquid manure per year and about 200m3 of space on your farm. What do you get from Dairy Energy? Our expertise, knowledge and skill to take you through the funding options, FREE planning application service (worth £500), build, install and commissioning of an award winning, ready to use Biolectric micro AD digester with the capacity from 10kW to 44kW. Followed up with service and maintenance through the life of the system. 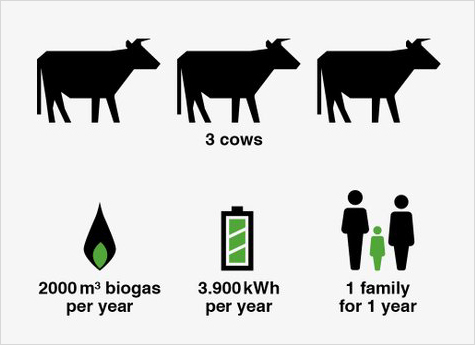 On a farm with 80 cows the yearly CH₄ emission of manure is equal to the CO₂ equivalent of 110 160 kg per year. By placing a Biolectric biogas installation this CH₄ (Methane) is converted into green energy and heat, enough to replace 110 cars off the road every year.